Launched in July of 2010, today’s featured chocolate with a soul is from a company hanging out in the DC Metro Area (specifically, Woodbridge, VA). 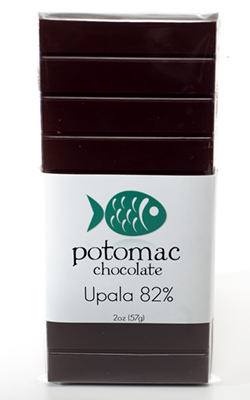 Potomac Chocolate is a small, artisan company that takes cacao beans through each step on the way to a final bar – just the beans and sugar! While savouring a piece of the 82% Upala bar, I got the low-down on this up-and-coming chocolate company from the founder, Ben Rasmussen. Well first off, what enticed you to go into chocolate-making initially? At one of these tastings, a friend said something to the effect that we should try making fine chocolate. I was skeptical at first, but after a little research I decided it would be interesting to try. About a year ago, we acquired a few pieces of machinery, experimented and succeeded in making a few batches of not-horrible chocolate. During those first efforts, Potomac Chocolate was born… naturally, with requisite delusions of grandeur! While I enjoy a lot of different chocolate and chocolate confections, my first love is pure, dark, single-origin, bean-to-bar chocolate. Before getting into making chocolate, I was fascinated by the wide range of flavors that chocolate makers were able to draw out of the cocoa beans, particularly how one maker's bar from a specific origin would bring out certain flavors that were sometimes radically different from another maker's take on that same origin. So, when I got into chocolate making, bean-to-bar was the only direction I was interested in. Bean-to-bar is an (almost) complete creative process, giving the chocolate-maker the freedom to impart his/her own vision on the flavor and texture of the chocolate. I say 'almost complete' because there are steps out of the control of a small chocolate-maker that happen on the cacao farm and that can greatly impact the flavor: harvest, fermentation and drying. However, I do hope to reach a point where I have some impact on the way these processes are carried out. So in this case, obviously the source of beans is a crucial factor in the quality and flavor of your chocolate. How did you choose your current source of cacao? Are there are any particular factors that were influential? Flavor and availability were two of the most influential factors for my first source of beans. One of the biggest hurdles for new chocolate makers to overcome is cacao sourcing. Since I have such a small production, it was difficult to find cacao suppliers who supplied high-quality, good flavor beans AND who were able and willing to work with the tiny quantities of beans that I use. Of course social equity and environmental sustainability are also very important to me. My current beans come from the Upala Organic Cacao Growers Cooperative and are both certified organic and fair trade. Although, I'm much more concerned with the actual conditions on the ground than the labels themselves. At my current size, I have very limited ability to influence that. For now, the main thing I can do is do my research and purchase beans above market rates directly from the farmers or from reputable importers. Eventually, I would like to form a partnership with cacao farmers where I would have a much more direct impact on the conditions for the farmers by helping to improve the quality and marketability of the beans. I can see how there would be many hurdles to starting a small chocolate company, by what would you say are the biggest challenges you have faced? This is a tough one. As the sole employee of Potomac Chocolate, there are a lot of challenges. One of the biggest is simply time. There's just a lot to get done and generally not enough time to do it. Also, it is difficult working on such a small scale. I've already discussed the issues with sourcing cacao, but it also extends to other areas, like equipment. Chocolate-making equipment for the really small artisan chocolate maker is a rarity, so I repurpose some equipment that isn't really designed for making chocolate, and have even built some of my own equipment from scratch. For example, I built my winnower and plan to build a drum roaster that will be able to roast a lot more beans than my current roaster--a convection oven! Sounds like you are pretty handy with crafting your own equipment; what did you do in your former life? My former life is actually still my current life, in that I still have a day job in I.T. Most of my skill with building stuff (such as it is) comes from my long-held interest in DIY and just general tinkering. My goal with Potomac is to continue to slowly grow the line of chocolate bars that I offer, and to continue to expand into new retail shops. I am about to start working on my first non-Upala origin bar and hope to have it available in the next few months. After that, rinse and repeat! Along the way, I plan to continue to study and learn more about the chocolate making process, upgrade my equipment, and continue to refine my process to further improve my chocolate. Final (and most important…) question – how would you characterize your favorite chocolate? In general, I prefer a bar with bold, expressive flavors that kind of punches you in the mouth. Of course a good texture and melt are key, too. And while my personal favorite is my 70%, I think all three fit the bill. They sure do. Potomac Chocolate is quite a treat, so get yourself to a chocolate shop and try some of this unique chocolate. Thanks Ben for taking time out of your busy chocolate-making schedule to regale us with the tale of your company. Looking forward to seeing where your path leads … hopefully to more chocolate!